Games industry veteran and Team 17 boss Debbie Bestwick was named the MCV Awards 2015 Person of the Year. In a video on the night, members of Team 17 and the industry at large paid tribute to Bestwick for her long and influential career within the games sector. Those featured included ID@Xbox European boss Agostino Simonetta, who said: "A few months ago when Xbox was about to launch one of the Team 17 products. Debbie really wanted to make sure that we delivered the product on time and to her specifications. So I got a very polite call from Debbie going through all the details of the launch for the day after. She wanted to make sure that we were on the ball as much as her team was." Sony’s Shahid Ahmad added: "Debbie is everything that is right with this industry." This award was one of three new prizes this year, along with Store Manager of the Year and Unsung Hero. Below is the video shown on the night of the games industry paying tribute to Bestwick. 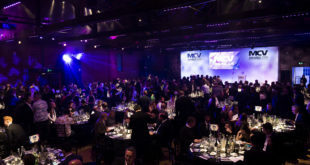 Up-and-coming comedian Romesh Ranganathan hosted the MCV Awards 2015 proceedings with panache, unveiling the winners and handing out prizes on Thursday April 16th at the Lancaster London Hotel. Over 71 companies from across the entire games industry competed closely for recognition in 22 different categories. Three brand new special accolades were also up for grabs, going to outstanding individuals recognised as Unsung Hero, Person of the Year and Store Manager of the Year, as well as three inaugural company award categories: Media Team, Agency Team and Independent Games Publisher. The partners of this year’s event were IGN, Gamescom, Curse, PDP, IGN, Green Man Gaming, Playwire, Respondez, OP, Scanavo, Click Entertainment, A4T and Novobox.